From the top of Carter Bar, arriving from England on the A68, the spectacular Scottish Borders stretches before you, as far as the eye can see. Your next stop is likely to be the historic abbey and market town of Jedburgh. From here, you can head off in any direction and enjoy a delicious taste of Scotland – maybe your first? 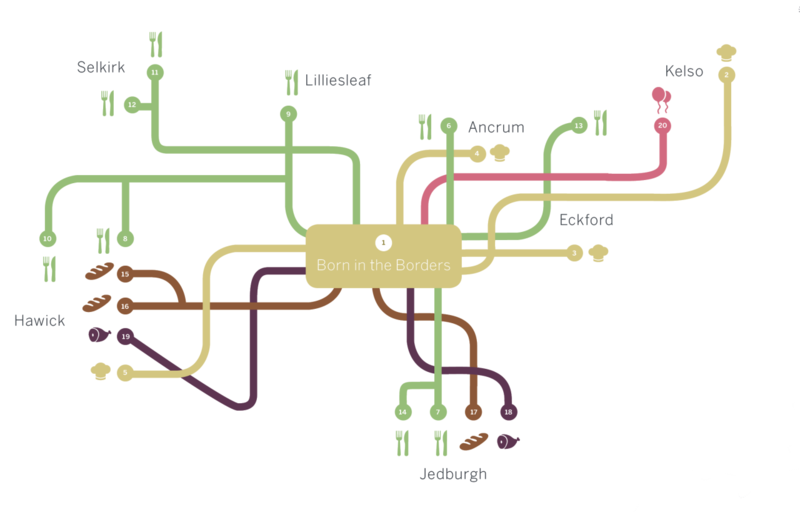 A few miles further on you can find Born in the Borders, with its café and restaurant offering a constantly changing showcase for the very best of Borders produce. Sample the local food and drink scene with a little detour to its deli, brewery and shop, in a delightful setting by the Teviot river. The daytime menu offers an introduction to the extraordinary range of produce the region has to offer, with soups, sandwiches and delicious main courses, whilst the evening menu takes the area’s ingredients to their culinary limit. Meander through this Food and Drink Trail. Take your time and enjoy the journey.